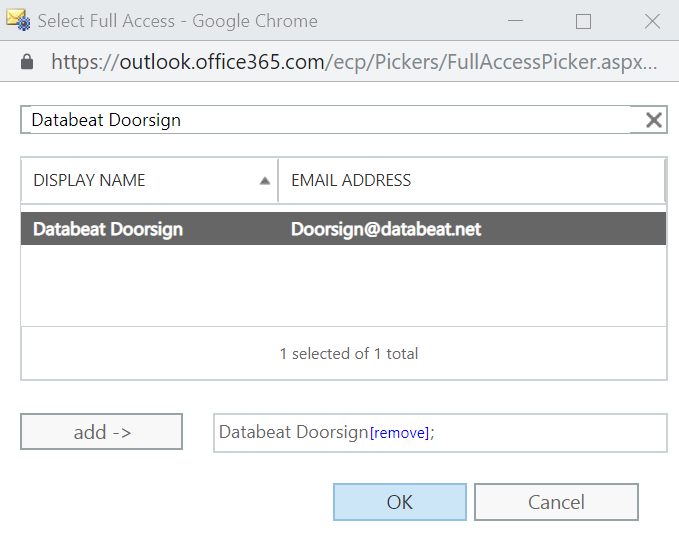 This article describes how to prepare Microsoft Office 365 to allow Databeat Doorsign to connect and display information from the calendar and to allow touchscreens to perform booking. This part is taking place in the Microsoft Office Exchange Admin Center only. It should take some 15 to 30 minutes, depending on your Office 365 competence. You need access to the Office 365 Exchange Admin Center on office.com. You need to have sufficient rights to create a user and assign the proper permissions and roles. Databeat Doorsign will be tested for Office 365, Microsoft Exchange 2013, 2016 & 2019. Older Microsoft Exchange versions may work but is not supported. If using Microsoft Exchange 2013 or newer, see the article for Microsoft Exchange for instructions. Support for Doorsign use with Google Calendar in G-Suite is aldo implemented. 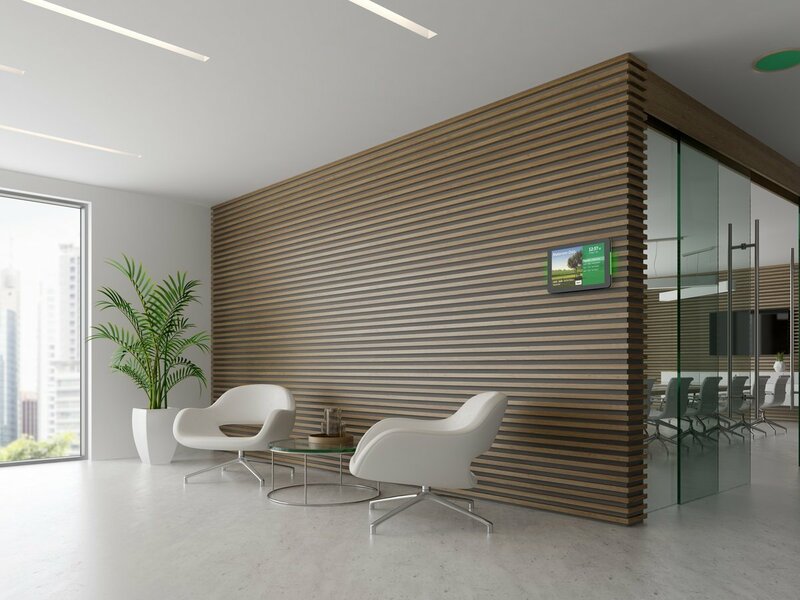 When done, the created Doorsign user will allow Databeat Doorsign to book, retrieve and display calendar information from your Office 365 users, rooms and equipment. We strongly recommend naming this user Databeat Doorsign (But it is not a requirement). You will need to set access permission to each resource (!) to be used with Databeat Doorsign. Access the Office 365 Exchange Admin Center from office.com or log on your Microsoft Office Admin Portal. In the left side menu expand Admin Centers and select Exchange. Continue in your Office 365 Exchange Admin Portal. Select permissions in the menu. Click + in the Roles section. Add Application Impersonation and Mail Recipients roles. Click Save after verifying mentioned roles. Select created Role group. Double-click it or click on the pencil icon above to edit. Click + in the Members section. Find and double-click your Databeat Doorsign User created in Step 1. Click OK to add the new member. Click Save after verifying that your Databeat Doorsign User is listed under Members. To manage resources (rooms or equipment) the Databeat Doorsign User must have Full Access Permission to each relevant resource mailbox, both for rooms and equipment. Select recipients in the menu. Double-click the relevant resource you want to display with Databeat Doorsign displays. Click + in the Full Access section. Find the user you will use to link Doorsign with and add this user as new memeber. Click Save after verifying that your Databeat Doorsign User is listed under Full Access. Repeat this process for each Resource (Room and Equipment) to be used with Databeat Doorsign. You are all set and done with preparing your Office 365 for Databeat Doorsign. 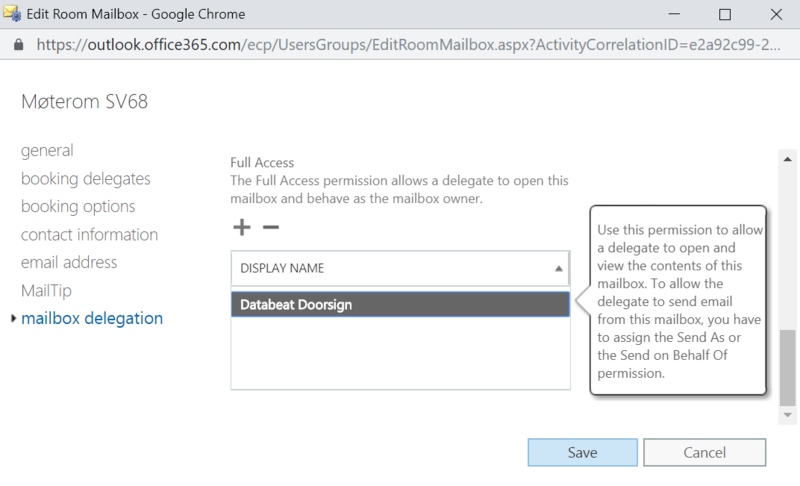 You should now be able to Connect Databeat Doorsign to your Office 365 using your new Databeat Doorsign user. Log in to DatabeatOMNI to configure your doorsigns and let the fun begin - Enjoy!